Hail damage is an ongoing concern for homeowners in the Glen Carbon, Illinois area. When severe weather has damaged the roof on your home, it’s important that you get it repaired before bigger issues develop. If you want to be sure your roof is in good hands, look to the experienced professionals at Daech & Bauer Roofing. We’ve completed more than 10,000 successful projects in the area, and our reputation as a top roofing company has helped us earn the Home Builders Association “Remodeler of Distinction” award on six occasions. 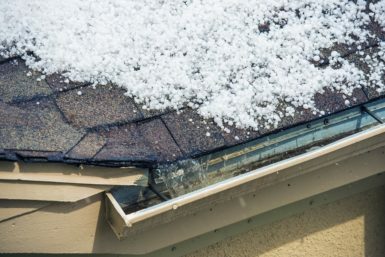 Once your claim has been paid, our technicians will promptly repair the hail damage to your roof. We will also back our work with a five-year labor warranty to give you additional peace of mind. Contact Daech & Bauer Roofing today to see why homeowners in the Glen Carbon, IL area count on us when their roofs suffer hail damage.